It's official: The Vampire Diaries cast is super close. Forget about that time Damon and Kai kissed in the rain, because there's a new funny and somewhat weird TVD moment you need to read about. If you thought Damon and Enzo were thick as thieves, wait until you hear about the relationship of the actors who portray them. Apparently, Ian Somerhalder gave Michael Malarkey a hickey during a recent Las Vegas convention. Say what?! While chatting with E! News about Damon and Enzo's bromance, Malarkey revealed ths interesting tidbit. He said, "One thing I can tell you is he [Somerhalder] gave me a hickey this week in Vegas. I tried to cover it up a little bit and it's just kind of a hard thing to explain to the Mrs." For those unaware, Malarkey is married to actress Nadine Lewington and they also have a son together. So, how did this hickey happen? Per the TVD star, "We were just messing around in the photo op booth because we had a convention in Vegas. Ian said everyone needs a little bit of Malarkey, and then he took a bite out of my neck." Somerhalder even filmed the hickey action, because Malarkey asked him to so he'd have proof that it was his co-star who made the mark, not someone else. Hm. 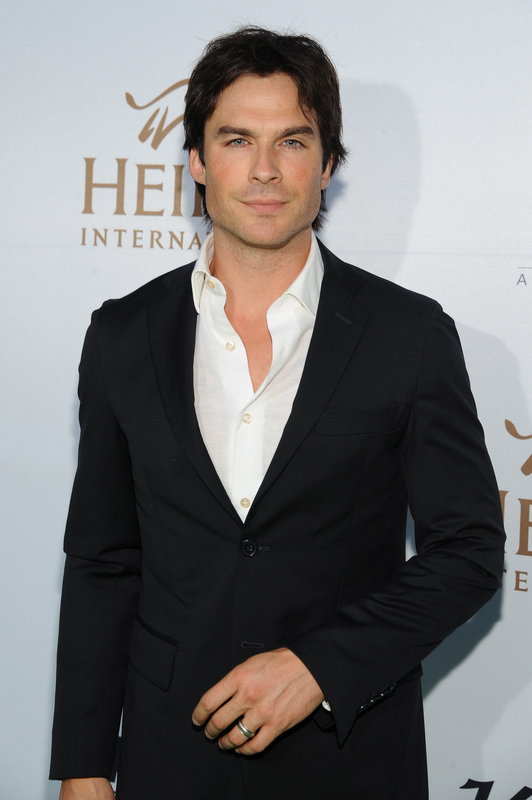 I guess Somerhalder just can't help himself when it comes to being a vampire on- and off-screen. I mean, I get that playing the beloved and sometimes dark vampire Damon Salvatore can be a strenuous role at times, but I never thought he'd go all method. Would I give my friend a hickey? Probably not, but Somerhalder was obviously having a bit of fun with his friend showing that the TVD cast is really tight when they're not filming. With that said, I'm going to need to see this video of Somerhalder giving Malarkey a hickey. Where is it, Ian? !